MARTIN: That’s the sound of Venezuelan doctors. Yesterday, they were on this bridge connecting Colombia to Venezuela. 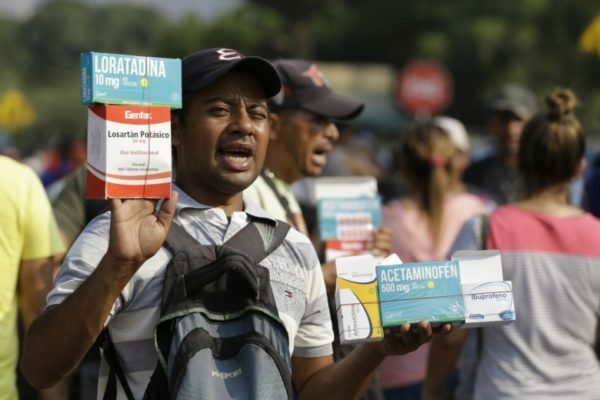 They are demanding that the Venezuelan military stop the blockade that is preventing U.S. humanitarian aid from getting into the country. The protests come as the power struggle in Venezuela continues between the U.S.-backed opposition leader, Juan Guaido, and President Nicolas Maduro. John Otis joins us on Skype from the border between Colombia and Venezuela. John, thanks for being here. MARTIN: What can you tell us about the aid, the U.S. aid, that’s – that they’re trying to get into Venezuela? OTIS: Well, you know, the U.S. has sent up a lot of non-perishable food items, rice and lentils and cooking oil. There’s baby formula and diapers, emergency medical kits. And it’s all being stored right near this big border bridge going across between the two sides. But as you mentioned, Maduro’s blocking the aid from coming across. He doesn’t want to admit that he’s overseen the worst humanitarian crisis in the country’s history. And, you know, he’s also saying that, oh, sending in this aid would sort of be a Trojan horse, a kind of pretext for a U.S. invasion of his country. OTIS: Oh, yeah, they’re very desperate. You know, those doctors we just heard who were protesting on Sunday told me that a lot of the children that they see now suffer from malnutrition. Studies show that most Venezuelans have lost, you know, a sizable chunk of weight due to the food shortages. There’s, you know, major medical shortages. One doctor even told me that patients have to bring in their own paper so she can write up medical orders. So that means doctor – you know, a lot of surgeries can’t be carried out, or people have to leave the country to get medical treatment. And so we’ve seen three million Venezuelans leave the country, and the U.N.’s expecting 2 million more to flee this year alone. MARTIN: So the military is blocking this aid from getting in. They’re doing so presumably at the behest of Nicolas Maduro. So he’s still got the backing of the military, then. OTIS: Yeah, that’s correct. And, you know, one of the reasons that the U.S. is sending up this aid and just putting it right there on the border is to try to tempt or persuade military officers to turn against Maduro and to support Juan Guaido, who the U.S. claims is the legitimate president. They’re hoping that they allow this aid to come in. And, you know, if that happens, that’ll be a big boost for Juan Guaido’s provisional government. And it could help bring about regime change in Venezuela, which is what the U.S. and the opposition is really pushing for here. OTIS: Well, that’s the thing. So far, there is really no sign of that. I mean, it could happen going forward. But right now, that’s not happening. And so this aid is just piling up out there on the border. Guaido has called for another round of protests for Tuesday. But so far, the aid’s just piling up and not getting in.